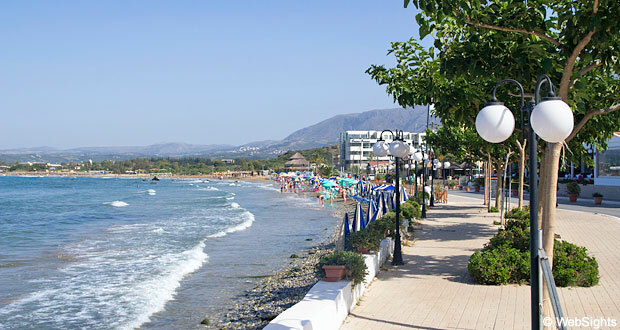 The holiday resort Georgioupolis is practically located halfway between Chania and Rethymnon at the north coast of Crete. 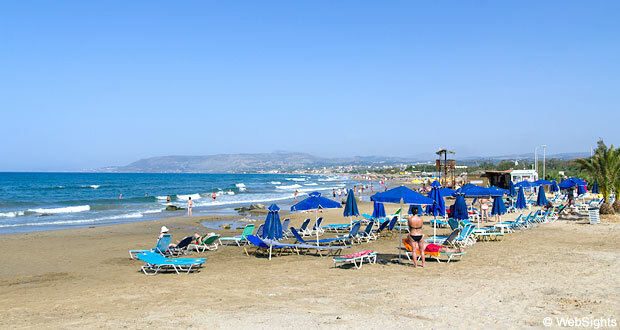 The main beach in Georgioupolis starts as a narrow strip along the sea front, but east of the town it becomes a long and wide sandy beach. The water is clear and relatively shallow, but in case of wind from the north, the waves may become quite heavy, so keep an eye on the lifeguards’ flags. 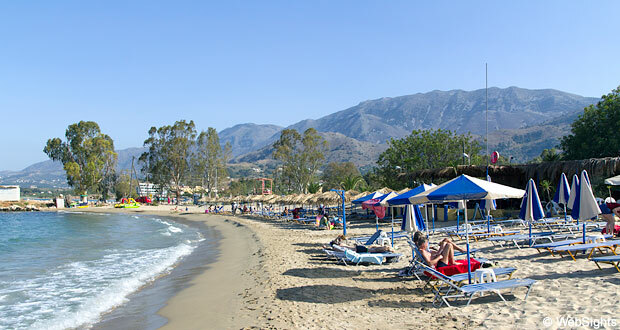 There are many sections with sun lounges and sunshades on the beach, which has obtained EU’s blue flag for its facilities and eco-friendliness. 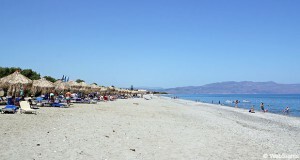 Four or five minutes’ walk north of Georgioupolis’ centre, you will find the smaller Kalyvaki Beach. A lovely, quiet sandy beach, which is well protected. The water is shallow at some parts of the beach. Lots of room to play and shallow water make the beach very child-friendly. Note, however, that heavy waves may occur when the wind blows from the north. A few water sports activities are offered during the high season, but not on days with heavy waves. There are many restaurants by the sea front. 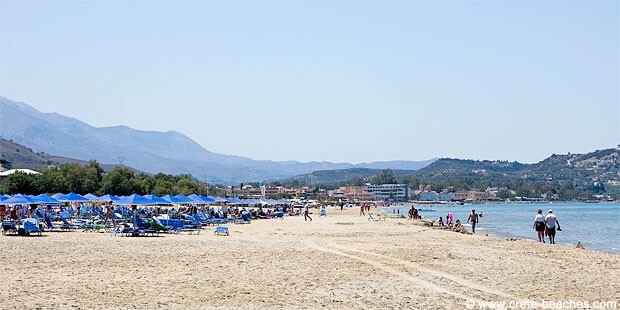 On the main beach, there are also several restaurants, but Kalyvaki Beach has one restaurant, which also acts as a beach bar. 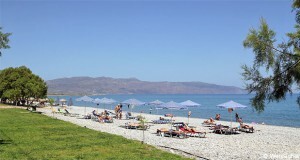 In the town of Georgioupolis, the visitors may have a relaxed holiday in an idyllic scenery. The centre of attention is the lovely town square and the sea front. There are many restaurants in Georgioupolis, several of these being small, family-run restaurants. They are generally known for their good quality and fair prices. 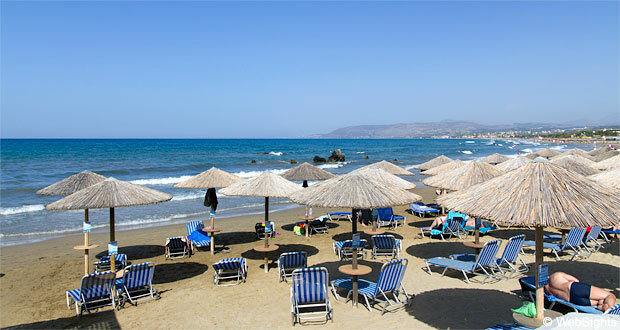 The hotels are typically also relatively small, the exception being the five-star luxury hotel, Pilot Beach Resort. It is located in a big park with direct access to the beach, but it also has a giant pool area.